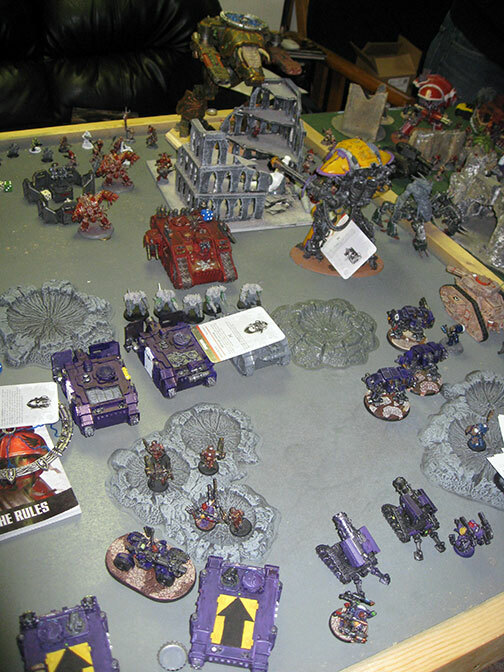 Warhammer 40,000 – I've been paying a loose campaign with four of the guys in my regular play group. 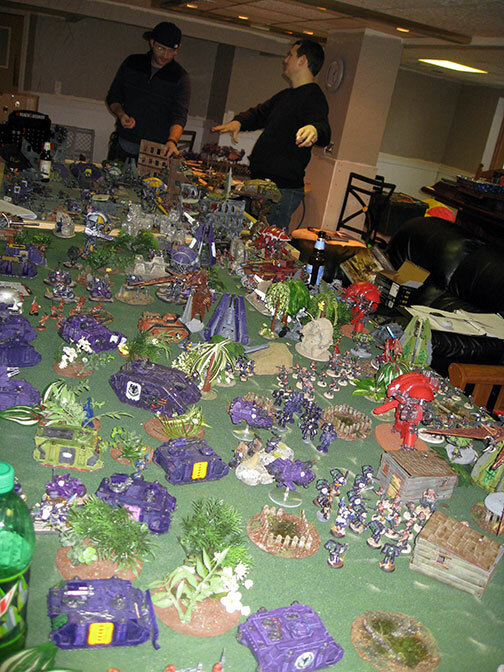 To ring in the New Year they wanted to play a massive game. 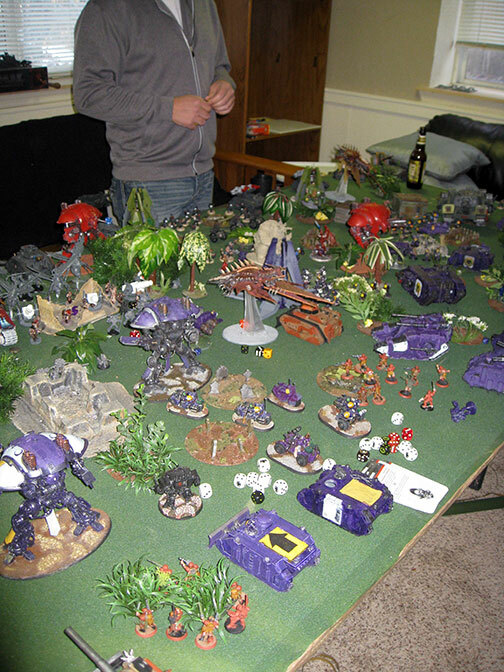 Initially the discussion was to play 40k of 40k (20,000 per side) we lowered that to 16,000 as my partner could only make about 4,000 points. After the last larger game the four of us attempted to play Christmas Eve eve, I expressed my concern that in order to play this we'd need at minimum 10am-8pm to play. (assuming everything went smooth). The general consensus was it wouldn't be a problem. If we couldn't seize the initiative Chaos would be going first. A quick roll turned up a six and we prepared to start our turn when our opponent informed us that he bought a legacy of glory that causes your opponent to re-roll any attempt to seize. I picked up dice annoyed and manage to flip another six. The look on their face was priceless. We began to pummel their side with a ridiculous amount of fire power. As we continued to roll our turn lasted until almost 2:30pm. During our opponents turn they needed to stop to take a phone call. It turns out someone wasn't clear with how long this would take and was getting questioned with how soon he'd be home. Turning this massive apocalypse battle to a hard stop at 6:30pm. Sadly they wrapped up their first turn right around 5:15pm. Deeming it not fair to bring on our reserves and begin the second turn we called the game after one turn and totaled victory points. We had scored 11 points of the maelstrom cards and an additional 3 for holding objectives, the forces of chaos had scored 5 points and held 3 objectives. Surprisingly we managed to squeak out a win with well over 1/3 of our forces not on the table yet. The small amount we played was fun but I can't see ever attempting that large of a game with four people ever again. The set-up and process just takes forever and having a random "emergency" pop up can really mess up the timetable. The general consensus after this event was we'd keep everything to 4,000 per person max. It's twice as big as a "normal" game but still something that should be able to play through 4-5 turns over the course of eight hours.